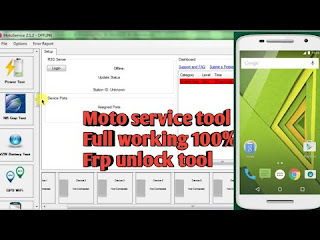 Hello, guys welcome to our website, today we are going to tell about Moto Service Offline Tool v3.0.4 it is a very useful and powerful tool. using this great tool you can solve any kind of problems on your Moto mobile phone easily. this is one of the best Moto mobile managing tools. if there should arise an occurrence of any blunders and malware in the product or issues caused by the equipment, you can simply use a tool like Moto Service Tool to take care of those issues. Moto service 3.0.5 Full. Offline Version Working Supported Frp: 5.1 / 6.0 /6.0.1 /7.0 /7.0.1 FRP Motorola Bypass 7.0 & 7.1 1. Install "Moto Service 2.1.2" 2. After installation, perform the following procedures: The. Go to "C: \ Program Files (x86) \ Motorola \ . The farthest point of this device at which this can marks is unbelievable. You can experience each issue what you face while utilizing the telephone. You name the issue and there will be the correct answer for that. to utilize this, first download this from the connection, if there is a compressed document, unfasten it, and twofold tap on the setup Ale, to introduce it on the PC. B. Rename the “Motoweb.dll” DLL to Motoweb2.dll. w. Then go to “MotoService” for the first time and close. 6. Remove the appliance from the mains and switch it back on FACTORY MODE and Power button again connect to the computer, this will enable the option to Enable USB debugging to check the option and ok.
7. Open the ADB command prompt and make the second procedure of the old devices (G2, G3) by entering the command below. 10. Switch the device off and on again and it will be unlocked. Now just download Moto Service 3.0.4 Offline tool from below given download link and install it on your computer then use. the download link is protected from dangerous virus and other threats and now it working properly 100% without any difficulty. just download and use for more functions.